I don’t know where I found these. I think someone gave them to me. 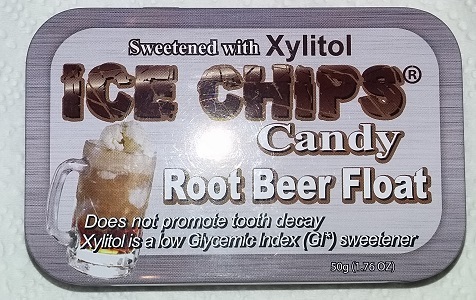 Part of the reason I decided to start writing about all of these root beer products after all is because people give them to me regardless (the other part being I have to write about something…) So yeah, xylitol? It’s a naturally occurring sugar alcohol. You find it a lot in gum because it still tastes sweet, it still has calories and is metabolized, but sugar alcohols don’t promote tooth decay. I don’t know why, I’m neither a dentist nor a chemist so I’m just gonna believe my five minutes of googling on the matter and call it good. Yes, I know it’s a root beer float candy and not a root beer candy, but these posts are already setting their own rules so I say it’s well within the realms of “root beer products”. I’m not near as picky about these things as I am about actual root beer. It has an interesting root beer type taste with some creamy vanilla undertones to make it root beer floaty, it isn’t very strong but it isn’t bad. It has a kind of off texture, the kind you get when you make crystallized candy that isn’t from sugar. It seems best to not chew them for that reason. There is only the slightest hint of off flavor from only xylitol being a sweetener. All in all they’re surprisingly good, considering what they are and what they’re made of. I honestly expected much worse. Now, if you’re looking for a root beer candy, do I recommend them, err, no. While it isn’t bad for a sugar alcohol sweetened candy, and while those end up much better than diet sodas cause, calories still, it still doesn’t taste like what you’d be looking for in a hard root beer candy or root beer float candy. But it isn’t bad so I eating it isn’t a punishment, just not much of a pleasure. 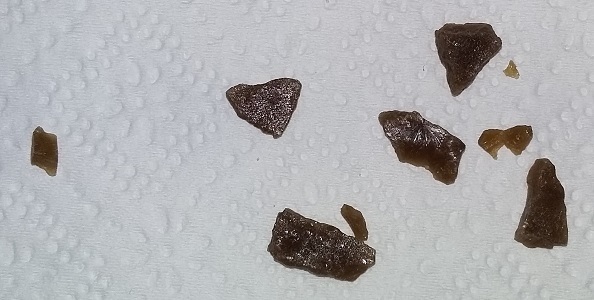 Some of the ice chips. They are chips.